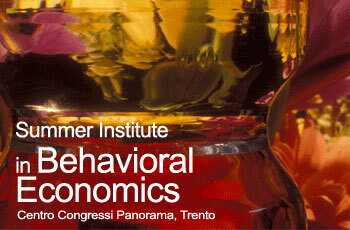 From June 15 to June 26, 2008, the Russell Sage Foundation along with the University of Trento will sponsor the eighth Summer Institute in Behavioral Economics, to be held on the campus of the University of Trento, in Italy. The purpose of this workshop is to introduce graduate students and beginning faculty in economics and related disciplines to the findings and methods of behavioral economics. Behavioral economics is the application of psychological theory and research to economics. Psychological foundations to be covered include decision-making under risk and uncertainty, intertemporal choice, heuristics and biases in judgment, mental accounting, and social preferences. These concepts will be applied to topics such as savings behavior, labor economics, game theory and finance. The schedule will include sessions in which students will be introduced to the psychological foundations of different economic topics, seminars in which visiting speakers will present recent research papers that apply psychology to economics, and opportunities for students to discuss their ideas and research with the organizers, other faculty, and other participants.